Time of Day – What is the neighborhood like at different times of the day? What are the traffic patterns? What about noise? Does it seem safe? Costs and commute – Does the neighborhood have a homeowners association? What are the dues and what does that include? How long is the commute and how much will you spend on gas? Appearance – What is the architectural style of the homes? Have they been maintained? 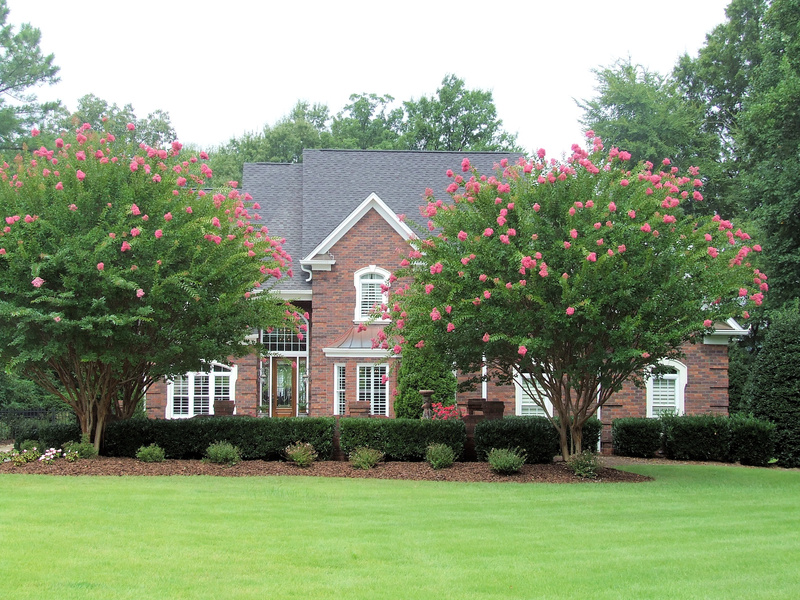 Are there mature trees and landscaped common areas? Connectivity – What is nearby? Think about shopping, restaurants, worship facilities and banks. Can you walk or bike anywhere? Schools – The schoolhouse at the end of the street is a priority consideration. Even if you don’t have children, the quality of the school will greatly affect resale value. Poet Robert Frost once said “Good fences make good neighbors.” But when you’re choosing a neighborhood, peek over the fences and take a closer look. Do your research, ask questions – and find your fit. Real Estate Market: WHAT IMPACT DO FORECLOSURES HAVE ON MY HOME’S VALUE? We are often asked this question by homeowners – those considering a sale as well as those curious about their neighborhood values. The answer is … “It depends”. If you live in a community with few to no foreclosure activity, the chances are you will be minimally affected by this situation. Unless other sales in the neighborhood were distressed (such as short sales) the history of activity and pricing will be represented by transactions between traditional sellers and buyers and the values will mirror the overall market. This does not necessarily mean your values have or will remain the same, it simply means the values will be in line with the overall market in the region. If you live in a community where foreclosure activity is present, there could be an effect on values in your neighborhood. Typically, appraisers (and buyers) will discount a single foreclosure in determining values for other active homes on the market. However, if there are several recent foreclosures, the appraiser (and buyers) will typically use those sales as “comps” in the market. Those comps are typically lower than traditional sales and will impact the prices accordingly. To put this foreclosure matter into perspective, consider the following. Nearly one-third of all homes in the U.S. carry no mortgage. So, when you hear that the foreclosure rate is nearing five percent of all mortgages, that number excludes homes without mortgages and the actual rate of all homes is lower. Also remember, more than 90% of all borrowers remain current on their mortgage payments. Are you interested in knowing whether your neighborhood prices are affected by foreclosure activity, please call or e-mail us. We will be happy to do an analysis of the market and report back with specific details. 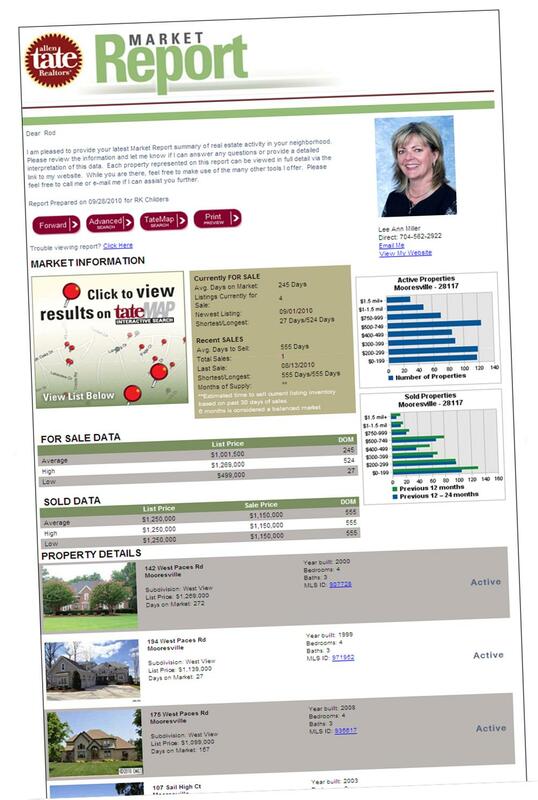 Lastly, if you are interested in knowing about real estate activity in your neighborhood, we have a great new tool called, “Market Report” that summarizes all active, pending and sold properties with links to detail pages, mapping tools and other statistics. This e-mail report can be sent monthly and the feedback from our clients has been awesome. If you are interested in receiving this valuable tool, please give us a call or email. Real Estate Market: Do You Know What’s Happening in YOUR Neighborhood? Curious about housing activity in your neighborhood? What’s on the market? What is your home worth? What are the market trends? Designed for homeowners, the new Allen Tate Market Report keeps you up-to-date on the real estate trends and activity – specifically where you live. For your convenience, Market Report is delivered via-email to your inbox only once a month (or less frequently if you desire) – putting the information you need right at your fingertips. To receive your customized report subscription to Market Report click on the link below. Homeownership is wonderful thing and a source of pride like no other. You get to build equity, deduct taxes and interest, plus have a place to call your own. With that said, there is a lot more than just buying and selling your home. As your trusted real estate advisors, The Lee Ann Miller Team is here to help you maximize your investment and release some of the hassles of homeownership between purchases. Here’s how: Re-insurance- You should do an annual insurance “checkup” to make sure your coverage is adequate to cover the replacement value of your home and contents. We will be happy to assist you and give you a few of our favorite Insurance agents. Remodel– You have to be careful when remolding your home. Some improvements can be “over-improvements” while others can be ‘”under-improvments”. We can help you determine which improvments will give you the biggest return on investment and those you should avoid. Refinance– Interest rates are at a historic low however, they are expected to rise soon. This may be your last opportunity to refinance and lower your rate. We can advise you if it makes since to refinace and put you in contact with some of our trusted Mortgage consultants. Re-valuation– Monitoring the recent sales in your neighborhood and keeping up with the current real estate market makes you a smart homeowner. Ask us how you can receive a customized Market Report to keep you in the know! Repair- unfortunately, this is a big part of homeownership. Things break and it is usually when it’s least convenient. Let us connect you with trusted vendors. That’s one less thing you will have to worry about. Re-asses- When you receive your annual property assessment, do you know what it means? Do you think it is fair? What actions can you take if it’s not what you expected? I can help you understand your assessment and advise on how this may affect the resale of your home. Referrals– If you didn’t already know, your referrals are our greatest compliment. We would be happy to provide your family, friends, neighbors and colleagues the same service and knowledge. Whether they are moving across town or across the country, we can help them sell their home or find their next one. Contact your favorite advisors today! What’s All the Huffing and Puffing About in North Carolina? Will It Blow Our Houses Down and Our Insurance Companies Away? Just as President-Elect Obama has the economy to keep him awake at night, our newly elected North Carolina Commissioner of Insurance, Wayne Goodwin, has inherited an issue sure to cause nightmares. What do you do with a $70 billion coastal property exposure growing at the rate of $900,000.00 per month but not enough insurance to put it all back if hit with a Katrina? Most homes insured along our coastline are covered for wind and hail through the NC Beach Plan, also called the Wind Pool, sometimes called the Last Resort. This is a result of insurance companies excluding wind and hail on homeowners policies because of the huge exposure. This plan currently has around $2.4 billion in reserves, or money available to pay claims. Do the math. $70 billion minus $2.4 billion equals NOT NEARLY ENOUGH MONEY. What happens if (or when) our coast has a major storm? When the $2.4 billion is handed out and more is needed the state will begin to access all licensed property insurers in NC according to their percentage of the market. For example, Hurricane Floyd hit the coast in 1999 and a carrier could have easily been assessed $30 million. If a major storm hits the coast their cut of the damage today would exceed six times that amount. So even though companies may choose to exclude the coverage, they still have to help pay for the claims. And if some companies declared bankruptcy as a result of a major storm the remaining companies would be assessed again. How does this impact us? Many options are being explored: • Increase homeowner premiums for coastal property. • Increase wind and hail deductibles for coastal property. • Increase homeowner premiums across the state. • Many of our companies are already asking for a better spread of risks; they want agencies to write auto and other lines of business as well as homeowners, or we may be forced to move the homeowners only client to another company. What’s the worst that could happen? Companies could begin a mass exodus out of North Carolina. Farmers Insurance has already left the state. Encompass, an independent market of Allstate, has declared a moratorium on new property insurance. Nationwide announced they will stop writing new “wind and hail policies” in North Carolina. As with the economy there is no quick fix, just the hope that the wind doesn’t blow for a few more years until this can be resolved. In the meantime, I will let you know of any changes that may affect you or your clients. Sunset Beauty! 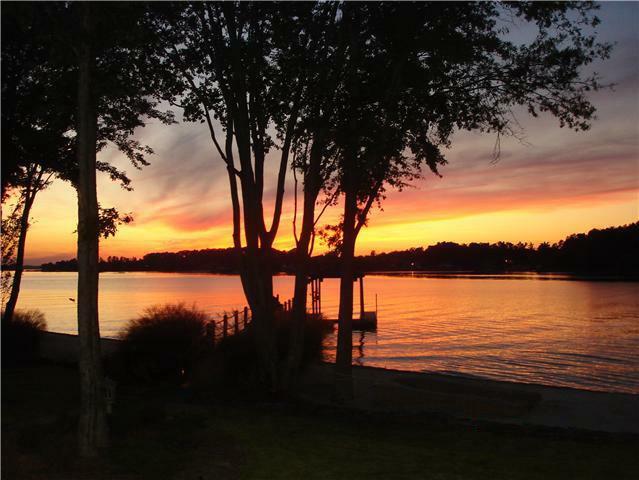 Click Here to view additional information & photos HOUSE INFORMATION: Wonderful waterfront home with breathtaking sunset views! 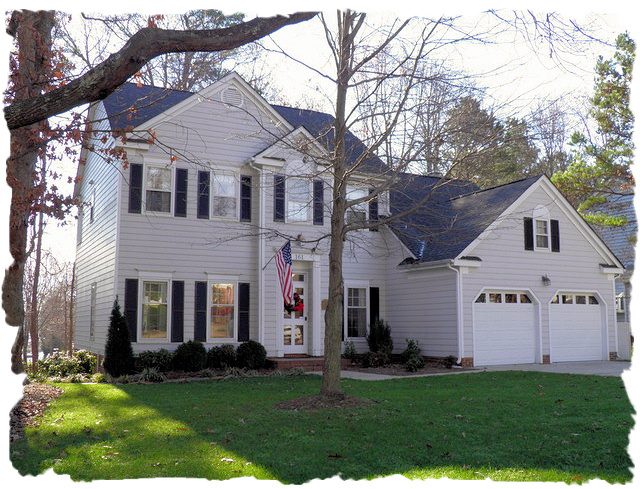 Transitional 2.5 story, full brick home nestled on 1.17 acres. Private owner’s suite located on main level with views of Lake Norman, lighted tray ceiling, sitting area, access to covered terrace & luxurious bath. Owner’s bath features heated tile floors, dual sinks, whirlpool tub & a separate spa shower. Great room boasts two story ceilings, built-in cabinetry & great water views. In the kitchen you will notice the beautiful contrast between the dark cabinetry & the granite countertops, island, stainless appliances, bar height sitting area, good cabinet space & separate breakfast area. Columns, tray ceiling & picture frame molding offset the formal dining room from the grand entry. The main level also features a home office & two staircases. The second level offers three bedrooms and a first class media room with wet bar & theater seating. The third level offers good flex space which could be used as storage, exercise room or studio. One of the best features of this home is the yard. Huge front yard with wrought iron gated entry. Gorgeous rear yard with lots of room to relax & enjoy the lake views. Large terrace that overlooks rear yard & lake with custom fireplace on one end & covered sitting area on the other. Plus this home has a side load three car garage, pier/dock with boat slip, hardwood & tiled floors, professional landscaping, lighting & over 20 zone irrigation system. A stunning home in an upscale, gated, waterfront community. Must see to believe!